Two Independent Cameras For Xiaomi Mi MIX 2? The rumors and speculations regarding the upcoming Xiaomi Mi MIX 2S keep growing and just when we thought that all has been speculated, something new pops up. Recent reports have it that the Mi MIX 2S will feature an AI equipped camera and it is expected to deliver remarkable results just like the Google’s Pixel 2. However, a new gif file released by Xiaomi with respect to the Mi Mix 2S is growing another line of speculation. 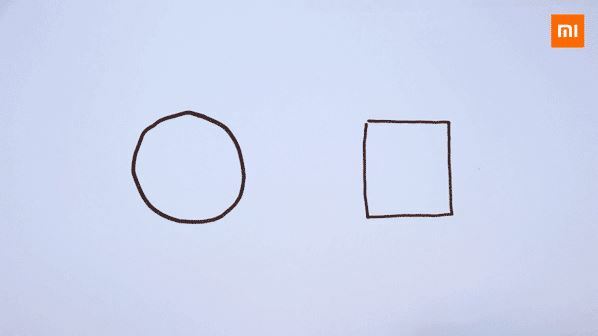 The gif file shows two hands sketching two shapes on a sheet of paper, one of the shapes is a circle while the other is a square. At first glance, we may see this as just two hands drawing shapes on a sheet of paper but it could mean more. Many smartphone enthusiasts believes that this is not just a useless teaser from Xiaomi, it could mean that the Xiaomi Mi MIX 2S will be featuring two independently working cameras which will be used for different scenes. Thus one of the sensors may be dedicated for images in bright light environment while the other will focus on dark environment images. From previous camera rumors, the Mi MIX 2S would have its selfie camera placed in the top right corner. The rear dual cameras are vertically arranged and an LED flash lies astride them towards the right. This smartphone will be powered by a Snapdragon 845 SoC coupled with 6GB or 8GB of RAM. All these rumors and speculations will be confirmed on March 27th when this smartphone will be launched. What do you think about this Xiaomi teaser? Is it just two hands drawing on a sheet of paper or there is more? Let us know your thoughts in the comment below.